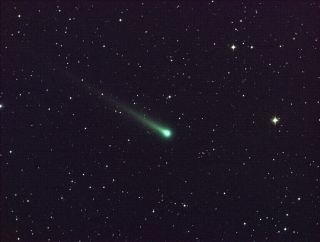 Comet ISON shines in this five-minute exposure taken at NASA's Marshall Space Flight Center on Nov. 8. At the time, the comet was 97 million miles from Earth, heading toward a close encounter with the sun on Nov. 28. Located in the constellation of Virgo, it is now visible in a good pair of binoculars. With excitement about the upcoming solar flyby of Comet ISON now approaching a fever pitch, I recently thought about a similar scenario that took place back in 1985 with the approach of Halley’s Comet. One Sunday in the magazine supplement of my local newspaper, an ad caught my eye for a department store telescope, complete with a king-size image of a comet hovering over the instrument. The ad explained that Halley's Comet was coming but was not expected to get very bright. Recalling this ad, I said to myself: "The only thing that this telescope is going to 'trap' will be unsuspecting people who won't see a thing through it. Those poor souls will fail because they didn’t know where to look, or because they didn’t learn how to use their new instrument properly. They're probably going to get very frustrated, and that 'wonderful scientific learning tool' is ultimately going to end up in the back of a closet or up in the attic." First: The most important requirements for successful comet viewing are complete darkness and a clear, unobstructed horizon. Darkness is absolutely essential if you plan to get a good view of the tail. You will need the kind of dark sky that you would find out in the open countryside, where you can look up and see a starry sky. Obviously, you won't find that kind of sky from a large metropolitan area or its immediate suburbs, but suitable spots exist within a 90-minute drive of nearly every residence in the U.S. or southern Canada. Even if Comet ISON fizzles out, you will still be rewarded for your trouble with a striking view that cannot be duplicated in city skies even with the aid of binoculars or telescopes. Second: The best all-around instrument is a pair of binoculars. Neophytes in astronomy will likely find binoculars' wider range of field better suited to comet-watching than a telescope. They are also much easier to handle than a telescope, and — best of all — they will show you all that is to be seen in the tail. Third: A telescope's main value is in magnifying the head of the comet. An eyepiece magnifying 30 to 100 power will provide you with very satisfactory results — even more so than with higher powers. Incidentally, steer clear of ads that boast about super-high magnification. Instead, you should judge a telescope based on the size of the objective lens or mirror. The bigger the aperture, the more light the telescope will collect, providing you with a better and brighter view. My own personal rule is 25 power per inch of aperture. So, for instance, if you own a 6-inch (15 centimeters) reflecting telescope, the most pleasing view will be at 150 power. Yes, a 6-inch scope is also capable of 300 power, but that’s the maximum for an instrument of that size, and it’s rare that atmospheric conditions will allow you to "push the magnification envelope," so to speak. Besides, if you are hoping to see the whole comet from head to tail, a high-powered image can actually end up being a bit disappointing. It's sort of like viewing a super close-up of the Statue of Liberty's right nostril. Always remember: if the telescope that you're checking out is advertising its power and not its aperture, it’s not worth purchasing. So unless you already own a quality telescope with a steady, first class mount, you would do better investing your hard-earned money in good binoculars instead. Editor's note: If you snap a photo of Comet ISON or any other amazing night sky view and you'd like to share for a possible story or image gallery, please contact managing editor Tariq Malik at spacephotos@space.com.